The Wareham Land Trust safeguards about 681 acres of conservation land throughout the Town of Wareham. As of February 2015, we own 164 acres and hold conservation restrictions on 517 acres. Most of these properties allow public access with trails that are ideal for walking and wildlife viewing while others offer canoe and kayak access to Wareham’s exceptional water resources. Below are some of the most popular conservation areas in Wareham. We encourage you to visit these beautiful properties. 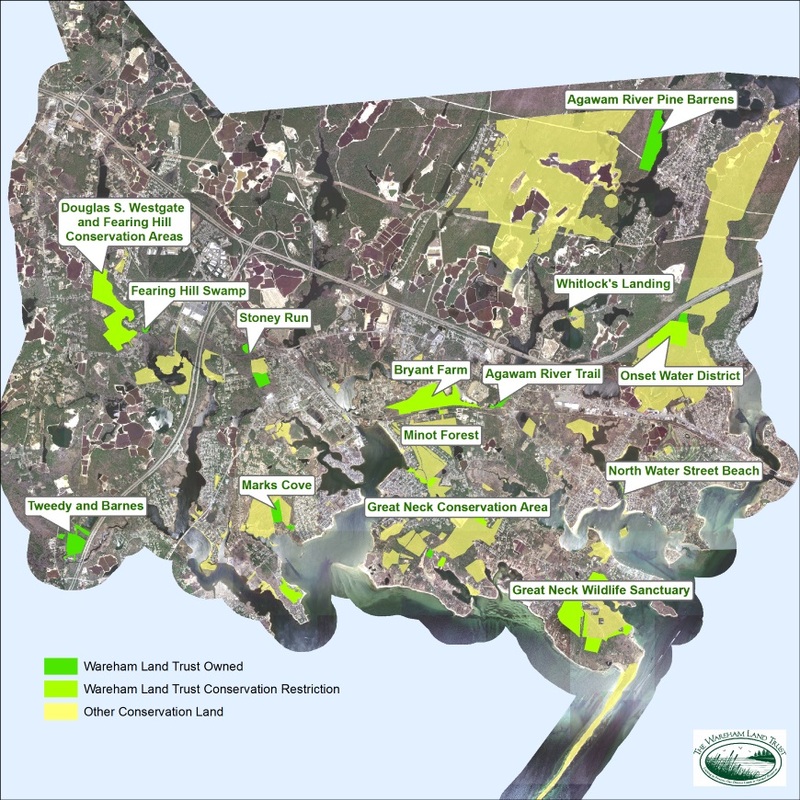 The conservation areas that the Wareham Land Trust protects exist through cooperative efforts of conservation organizations, the Town of Wareham, and the Community Preservation Act (CPA). CPA funds are instrumental in acquiring open space that significantly increases permanently protected conservation land with public access for passive recreation. Remember, some trails traverse private property; these trails are available through the generosity of private landowners who value land conservation and choose to share their land with you. Be respectful of the property owners and neighbors. Conservation areas with public access are open year-round from dawn to dusk. No fees are charged, but the Wareham Land Trust relies on charitable contributions; these donations help support land conservation, stewardship of the preserves, trail creation and maintenance, and educational programs. Please consider a making a donation to the Wareham Land Trust today. Enjoy these conservation areas and share the landscape with others.